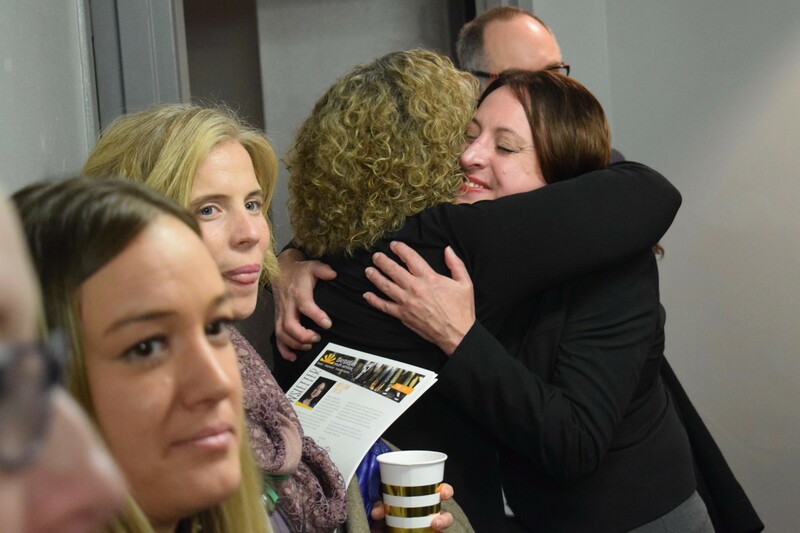 Daybreak CEO Annette Klinefelter, right, hugging Bev Coplin on Tuesday at the opening of the new psychiatric evaluation and treatment center for girls under 18 in downtown Spokane. More than two years ago, Terry and Bev Coplin saw something they'll never forget. They were the sole witnesses when a 31-year-old, the same age as their son, committed suicide in Colorado. Ever since, the Coplins have dedicated themselves to preventing suicide. It's why they gave a generous donation to Daybreak Youth Services that allowed Daybreak to open a new 13-bed psychiatric evaluation and treatment center for girls under 18, which opened today. "This is a happy day here," Bev Coplin tells the Inlander. "This is a wonderful thing that's happening. We really feel like out of that tragedy has come something that is very positive and beautiful." Four of the 13 beds at Daybreak's just-opened evaluation and treatment center. 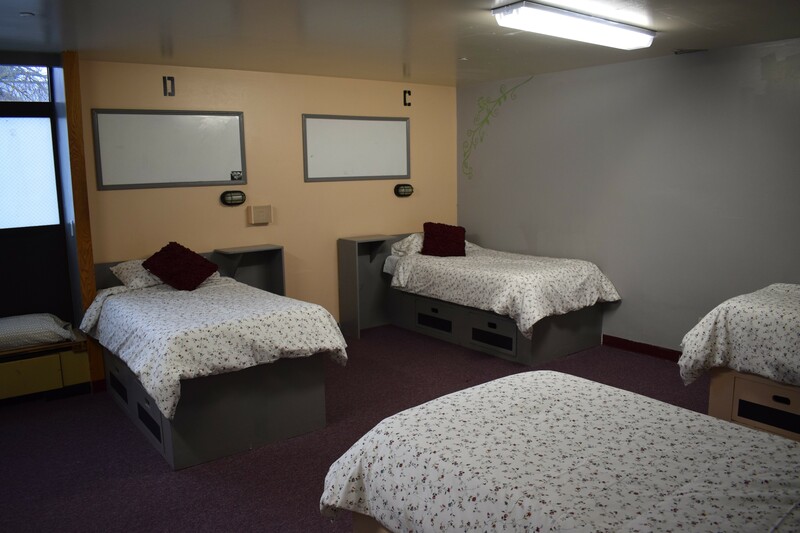 The evaluation and treatment center has 13 beds for girls in psychiatric crisis, including suicide attempts or ideations, severe depression, psychosis, anxiety disorders, schizophrenia and bipolar disorder. It's located in the girls-only Daybreak inpatient residential treatment facility in downtown Spokane, at 628 S. Cowley St. Annette Klinefelter, Daybreak CEO, says the gift from the Coplins allowed Daybreak to transform a residential wing to an area accommodating the 13 beds for the evaluation and treatment center. Nowhere else in Spokane, she says, is there a similar facility with a continuum of care that allows girls to enter the evaluation and treatment center and then, if need be, transition into the residential treatment center for substance abuse and mental health. Klinefelter says the new facility will serve a longstanding need in the community. Three or four years ago, the staff in the emergency room at Sacred Heart Medical Center reported to her that it was filled with a backlog of kids with acute psychiatric conditions. Klinefelter says Daybreak has been working to open an evaluation treatment center ever since. "We're really fortunate to have the Coplins," Klinefelter says. "They are very passionate about suicide prevention." Right now, all referrals to Daybreak's evaluation and treatment center are voluntary, Klinefelter says. Girls in crisis can stay in the evaluation and treatment center for a short time, or a longer time and transition into Daybreak's residential treatment facility that is connected. Daybreak's toll-free number is (888) 454-5506. Klinefelter says girls came into Daybreak already with suicidal ideations or psychosis related to substance abuse. "With this," she says, "we're able to transition them into residential treatment with the same warm hands."